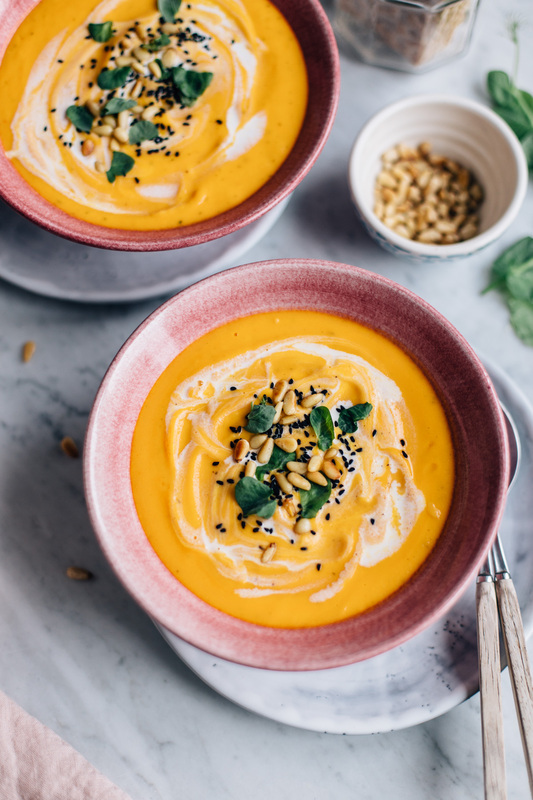 There aren’t many recipes that I keep making year after year because I’m more into trying new things all the time, but sweet potato soup is definitely a favorite around here. I keep coming back to it whenever I feel like having something warm, nourishing, comforting and simple. And generally I just love sweet potatoes in any from. If I’m not in the mood for simple things and I’ve already made the soup, I just add lots of vegetables, maybe some cooked grain, toasted seeds, fresh herbs and a bit of feta on top. Voilà, soup 2.0! This recipe is actually an old one from the archives, but while I was making it for the tenth hundredth time, I thought I’d take some new photos and share the recipe in English too. 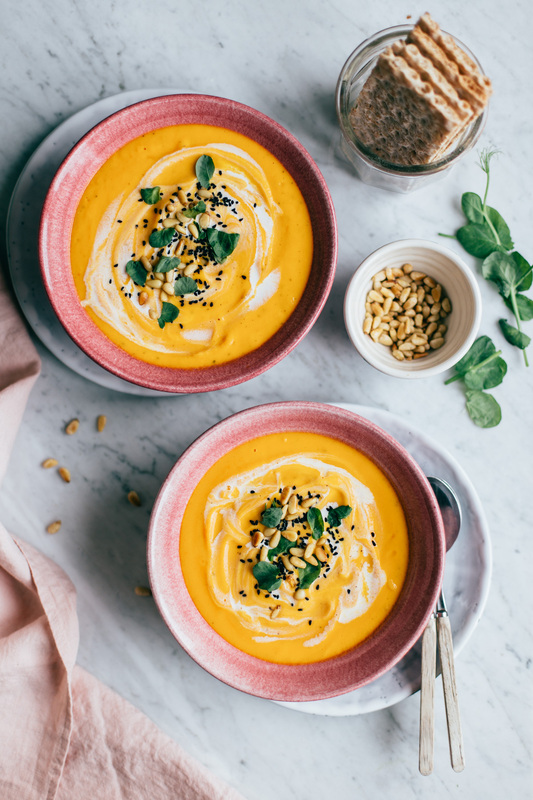 So here you have it, a very simple and warming sweet potato soup with hints of ginger, turmeric and chili. It’s an easy one too – I think the hardest part is to peel the vegetables, as it takes a bit of time and patience and patience really isn’t my strongest ability. But maybe you’re better at it! 1. Peel and chop the sweet potatoes, carrots, onion, garlic and ginger into small pieces. 2. Heat the coconut oil in a big pot. Add the onion, garlic, ginger and turmeric and sauté for a couple of minutes, until the onions are softened. Add the sweet potatoes and carrots and cook for a few more minutes. Add enough water to cover the vegetables and season with salt, black pepper and chili flakes. Bring to a boil and cook over medium heat for about 20 minutes, until the vegetables are soft. 3. When the vegetables are cooked, pour about two thirds of the water into a big bowl and set aside. Puree the soup with a hand blender or in a high-speend blender and add the coconut milk. If the soup is too thick, add more water. Blend until smooth and creamy. Taste, and add more spices if desired. Serve and enjoy! 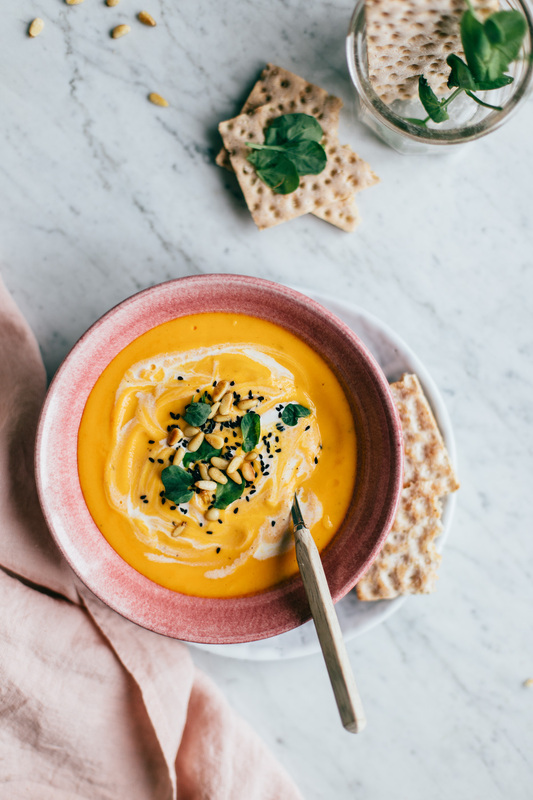 Tagged autumn, grain free, lunch & dinner, soups, sweet potato, vegan, vegetables, winter. This Nourishing Chickpea Stew is the perfect weeknight meal: it takes about 30 minutes to make, it makes a lot and it's a bowl of total comfort!